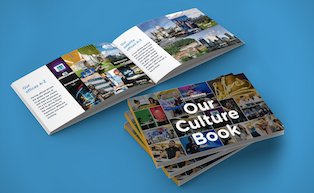 Download our Culture Book to discover how we live our values every day and incorporate all 10 steps of the Engagement Bridge™ in our culture. Through our work with more than 1,800 clients in 23 countries, we’ve built a deep understanding of company culture, employee engagement and the tools, techniques and best practice that companies use to build connections with their people. We’ve codified this understanding into a 10-element employee engagement model, the Engagement Bridge™ which documents the key parts of your organization and your relationship with your people that you need to consider in order to build a more engaged culture. Every organization is different and the model is your guide, not your specific recipe. Are you giving your employees something bigger to work towards, and do they understand your organization’s contribution to both your industry and society? 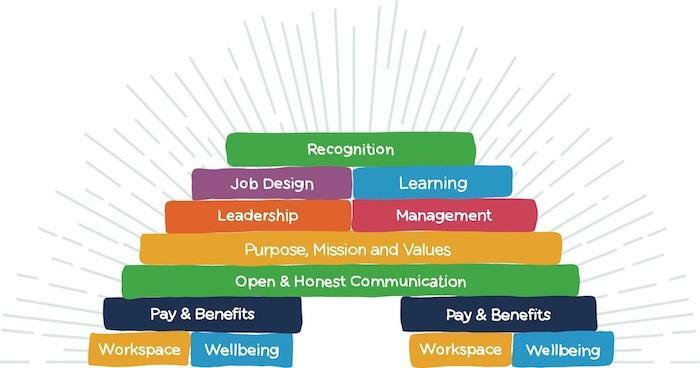 When I say Reward Gateway’s mission is, “Let’s make the world a better place to work,” I want our employees to understand that our offering — HR technology — is a means to better connect the organization to their people, in a variety of ways to build better engagement. How we do business is changing. Technology and job mobility is democratizing leadership. The best staff demand leaders be held accountable for being visible, being human, adding value and being a champion of the company’s values, developing a high trust culture. Management, by which we mean management practice (essentially, policy, and how your organization runs), is a separate element to leadership but we discuss them together to emphasise the point that if Leadership & Management are not kept in step you will end up with an inauthentic culture.